How do you configure the basics of Click & Collect in your Magento admin? Rate Configuration: If you would like to add a price to the Click & Collect option. This value will be displayed to the customer. Options: Enabling 'Show Estimate Shipping on Product Page' will include Click & Collect as a delivery option among the other options you have enabled. Store Map: Enable the store map to appear for customer selection. You can edit details such as the size, icon and name in this section. Checkout Calender: Allows customers to select a day they would like to collect the item. Ready for Pickup Template used to send “Awaiting Collection” email to customers. Admin Template used to send an email to the store notifying them that they have an order to be fulfilled and collected by a customer. Send admin email on invoice creation: The order to collect email will be sent to the store when the invoice is created. *You can upload the email templates in the system section of your admin, learn more. How do you set up locations? Location note: Allows a message about the store location to be displayed to the customer. How do you set up Zones? Zones are postcodes within a country that are supported by a Click & Collect option. Each Store needs to have at least one Zone assigned to it. The zone/s assigned to a store dictates the map zoom on the front-end. E.g. 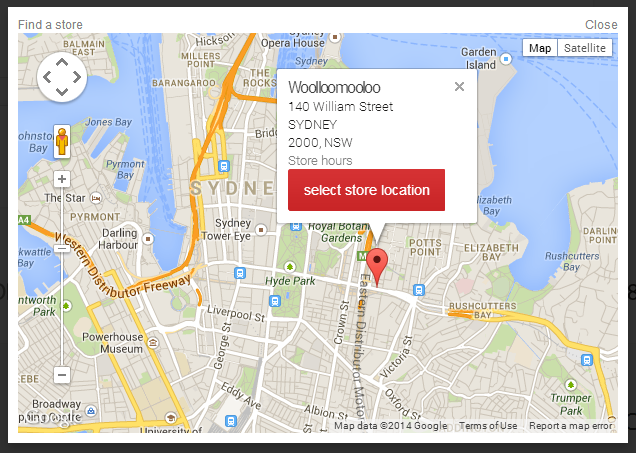 If postcode range 2000:2999 is supported by a store the map will zoom out to view the image of New South Wales. We talked in depth about setting up locations and zones in our previous post here. You need to use the same configuration method as discussed in our part 8 blog post. But this time the zones need to be created in the Click & Collect section of the Magento Admin. What does it look like for the store? 3. Any pending collections will be listed with a pending status, click on the order to view the details of the order and to access the pick slip. 6. Once the customer has collected their parcel make sure you enter the order number and confirm collection in the backend to keep records up to date. This will change the pickup state to order collected and the process is complete. Click & Collect is an easy and effective delivery option that your customers will appreciate being offered. If you would like to offer Click & Collect in your Magento store contact our team.